DE SANGOSSE has been developing and marketing molluscicide baits based on metaldehyde for more than 30 years. The Group monitors its authorizations under Directive 91/414 (1107/2009). DE SANGOSSE supports users of its products beyond simply making treatments available, through scientific and agronomic research. We have set up an OBSERVATORY of slug populations to enable us to measure slug pressure for each region in real-time and inform users of slug risks. 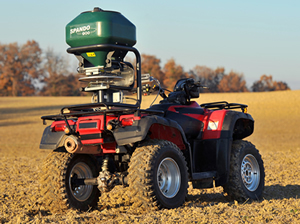 To optimize treatment conditions and to minimize environmental impact, DE SANGOSSE has developed a new granule-spreading device - the SPANDO. This device makes spreading more uniform and reduces the risk of application outside the target area. The technical skills of our researchers and agronomists are also available to resolve specific issues related to pest slugs and snails. We outsource some of these tests of specialized institutions recognized for their expertise.